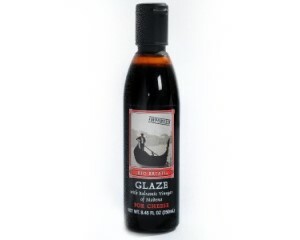 This cream, syrup like reduction of the Balsamic Vinegar is perfect for adding that distinctive Balsamic flavor to any number of dishes. The beauty of this particular white version is that you can use it in dishes where you want the balsamic flavor, but not the color. Ingredients:concentrated grape must, wine vinegar, modified maize starch, thickener xanthan gum, antioxidant E224, ascorbic acid.